And if I had lived differently, in a different part of the ocean? If I had lived in a different ocean altogether, would I too be different? If I was burrowing in warm water at the base of a coral reef instead of in cold water burrowing only into sand. I would miss the snow and ice that turns the ocean colder. I too like seasons, though you might not think it of me. It’s part of what makes me feel alive. I don’t need to go to exotic places, but I do need change. It’s the way I understand time, and even if it wounds me, I respect it a great deal. I see myself among other clams. We look so similar, yet we’re so various inside. One of us enjoys the full moon, another, eels. You wouldn’t think of a clam liking an eel, but why shouldn’t we be excited by other beings in the ocean? We’re not alone here; we know that well. Yet, in a way we are. Sometimes I feel very lonesome even when others are around me. Artist Statement: For my residency on Governors Island I planned to work on building models of the boat I'll be making in St. Louis this winter but I couldn't stop working with clams. 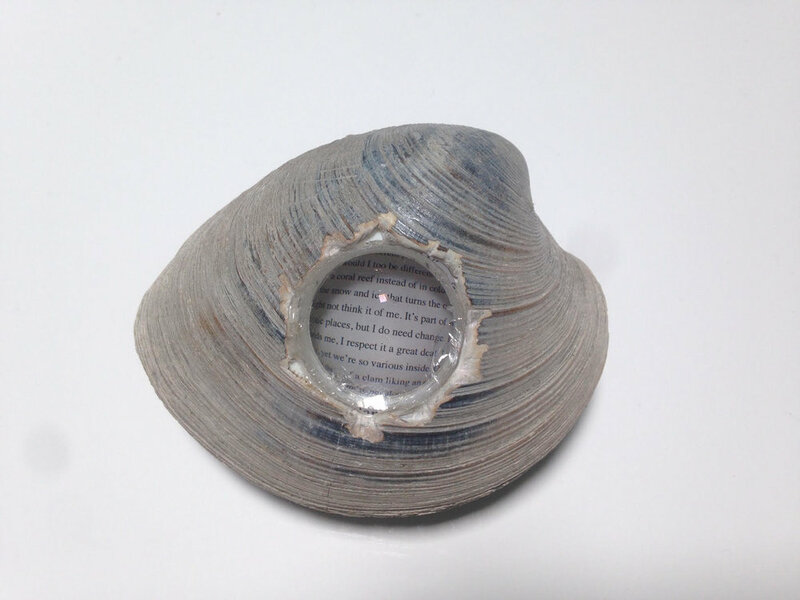 I had found a clam shell on a trip to Dead Horse Bay earlier in the summer and kept wondering if I could somehow make that clam into a book. While I was on the island I did many experiments with the clam form. This piece was a collaboration between me and the LA based writer Amina Cain who wrote this piece especially for the inside of this clamshell.